Based on our own travel experience, and reviews from our customers and Tripadvisor, we have selected the following must-see attractions on the mountain. The mountain is best reached by cable car. The aerial tramway ride is the longest in the world, taking about 30 minutes for over 7 kilometers. The last part of the cable way is very steep, going up at 37 degrees over sheer cliffs to one of the mountain peaks. The cable car starts close to the bus station and railway station. It is often very busy, and waiting in line is normal. The cable car starts at 7:30 in summer and 8:00 in winter. Our guide will suggest our customers to arrive there early (half an hour or more before it officially opens) to avoid a long wait. Otherwise you may need to queue for 2 hours or even more amongst noisy, chaotic Chinese tour groups. While your are waiting for the cable car, your guide is waiting at the ticket office for the cable car ticket for you. 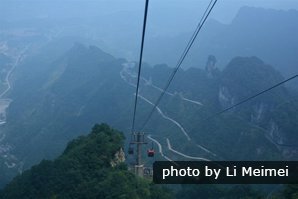 The scenery viewed from the cable car is fantastic: lush mountain peaks, the 99 Bends (99 sharp curves on a road up to the mountain peak), and deep valleys. One cable car holding eight people, and our guide is with you in the same cable car. The cableway may close when there are thunder storms, high winds, or heavy snowfalls. Our travel advisor and guide are flexible to change the itinerary to make sure you can visit the mountain if the cable car closes during your visit. The walkway was built along the edges of this mountain’s summits, clinging to the vertical cliffs. The walkway is about 1.6 kilometers long, about 1,400 meters high. The cliffside loop takes about 1½ hours. At the end of the walkway, there is a hanging bridge linking two peaks. It is always busy and crowded along the walkway. You may find you need to fight for a place to take photos. Avoiding the crowds is essential for you to enjoy the highlights and take good photos. Your experienced guide knows how to help you get the best out of the experience. 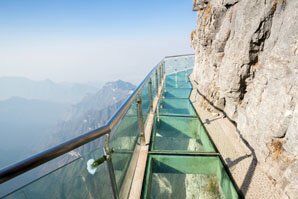 The third glass skywalk in Tianmen Mountain Scenic Area ‘Coiled Dragon Cliff Glass Walkway’ (盘龙崖玻璃栈道) opened to the public on August 1st, 2016. It offers a new way to enjoy the stunning mountainous landscapes — though you might be too terrified to appreciate the views! 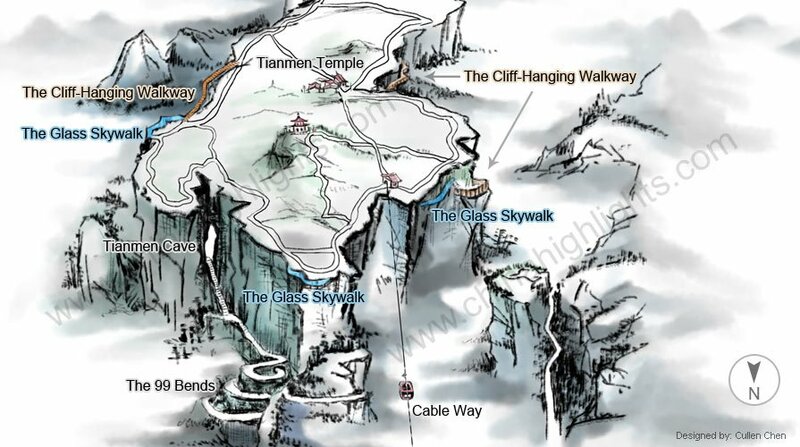 Stand on the crystal clear walkway, you can see all the way down to the bottom of the cliff and Tongtian Avenue (Heaven-Linking Avenue), which is the road up the mountain featuring a staggering 99 turns (see below). Dimensions: 60 meters (197 feet) long, 1.6 meters (5 feet) wide. It gives a thrilling feeling like walking in the sky. It is definitely not suitable for the faint-hearted. It is interesting to see people (scared of the height) leaning against the cliff as they cross it. On foggy days, it is easier to walk across as you can see nothing below, however the thrilling feature of the walkways is lost. If it rains the day before, there is usually heavy fog at the mountain top. You are advised to check the weather forecast before going to get the best experience. Our travel advisors can also give you some useful suggestions. The glass walkways close when they are covered by ice and snow in winter. The open chairlift is at the end of the hanging bridge. Two persons share a chair. It goes up to the summit of the mountain, where there is a tower. At the top of the tower, travelers can get an eye’s-bird views of the surrounding mountains. The chairlift takes about 20 minutes over densely forested peaks. There is usually another wait for the chairlift. Its cost is not included in the entrance ticket. It is normal to wait another 30 minutes. To the left of the chairlift station, there is a temple. 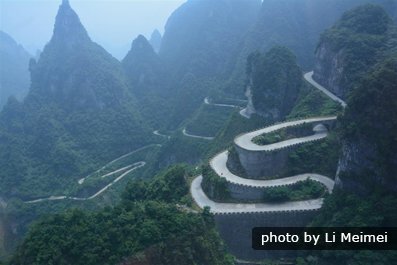 There are 99 sharp curves on the road up to Tianmen Cave, the famous 99 Bends. The best place to see and take photos of these bends is from the cable car. 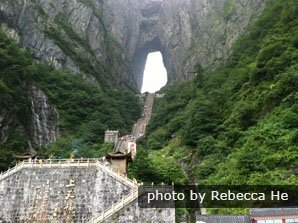 The road is built for tourist use, taking tourists from the mountain foot to the top of the mountain and Tianmen Cave. Tourist buses take travelers from the midway cable car station along some of these 99 bends to Tianmen Cave. The bus doesn’t stop on the way. It takes about 20 minutes to the cave. The ride, full of sharp turns along vertical cliffs, is not recommended for those who are easily carsick. If someone in your travel group don’t want to take the bus, our guide will help find a good relaxing place for him/her to wait for the rest of you. Tianmen (‘Heaven’s Door’ 天门 Tiānmén /tyen-mnn/) Cave is a large (30 meters or 100 feet wide) water-eroded hole between two peaks, like a huge doorway in the cliff face. It’s the highest hole of its sort in the world. To reach the cave, take a tourist bus (usually a mini-bus) on the 99 Bends (see above). Then there are 999 steep and narrow steps up to the cave — “the Stairway to Heaven”. It is a hard and tiresome climb (about 30 minutes). The views from the cave are quite plain, and it is always crowded, and hard to find a good place for photos. So it’s only really worth doing to say you’ve “climbed the stairway to heaven” and “knocked on Heaven’s Door”. The World Wingsuit League held the first and second World Wingsuit Championships at Tianmen Mountain, flying through Tianmen Cave! The tour needs more than half a day, even a full day if you want to travel slowly. Our guide will remind you to bring some snacks / a picnic. Food sold at the small restaurants on the mountain is expensive, and the quality is unreliable. We don’t arrange our customers to eat at the mountain restaurants. Cable car up to a lesser peak (about 30 minutes). Walk around the cliff-hanging walkways (about 1½ hours). Take a chairlift to the summit (about 20 minutes wait and 20 minutes chairlift ride). Explore the summit, climbing to the top of a tower for a photo or bird’s-eye view of the mountains. Take an elevator to the cable car station, and take the cable car back to the mid cable car station, where you can take a tourist bus to the cave. Climb to Tianmen Cave for about 25 minutes, and then take the bus back. Take the cable car at the mid cable car station down the mountain. April to October is the golden time to travel to Tianmen Mountain, as the temperature during this period is moderate and comfortable. Choose September for drier weather, while there is still warmth at the peaks. December to February is the best time to appreciate snow scenery on the mountain, and also for snow photography. The temperature difference between the foot and top of the mountain is large, so bringing some thick clothes to keep warm is necessary. The scenery is best on clear days. On rainy days there is usually thick fog (cloud) over the mountains, which covers everything. Mists are usually heavy if it rains the day before. The mountains in mist are a mystical scene, so there is an upside to the cloudiness. Entry: March–November: 258 yuan (42 USD); December–February: 225 yuan (37 USD), children under 1.2 meters free of charge, children 1.2–1.5 meters half price; students with student ID 158 yuan (26 USD); seniors (60+) 158 yuan (passport needed as evidence). There are clean squat toilets at every major sight. Your guide will tell you where they are. No toilet paper is supplied, so bring your own. There are shops at Tianmen Cave selling simple snacks (such as biscuits) and bottled water. Price are three or four times higher than those sold at the foot of the mountain. Ask your guide for help if you need to buy something as no English is spoken. There are storage services at the cable car stations. 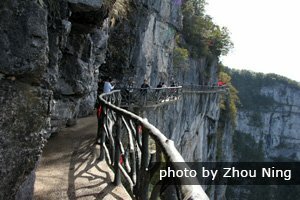 The tour requires a lot of walking, including 6 kilometers of easy walking along the cliff walkway and 999 steep steps. Long lines: As the mountain is very famous among Chinese travelers, expect to see large and noisy crowds. The red ribbons along the walkway: The Chinese hang them for special (superstitious) reasons. But these red colors really upset the harmony of the natural greens and grays. No English is spoken and there are no English signs, so it is not easy to find the way in such a big park if you travel alone. The fight for a seat in the tourist bus up to the cave is not something Westerners are used to. The mountain’s tourist area is BIG. A guide is recommended to help you deal with all the above hassles and for finding good places for photos. Tianmen Fox Fairy is an outdoor musical telling an old Chinese love story, with Tianmen Mountain and its deep valleys as the backdrop. It has received good reviews on TripAdvisor. The show is on every night. If you are interested, please ask your guide to book tickets for you, at extra cost.